– Shorpy has put together a fun gallery of digitally colorized black and white photos. 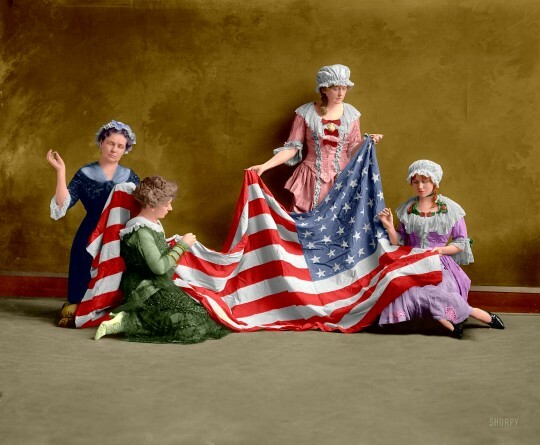 Pictured above, Birth of the American Flag – and the original version. – Legion, Coggles, Blackbird, Mohawk, and Stuart & Wright have started their seasonal sales. – End Clothing has posted some pictures from their Pitti buying trip. Includes some peeks at next year’s collections from Engineered Garments, Yuketen, Nigel Cabourn, and more. – From the NYTimes, there’s a good profile on the man behind Best Made Co. and an opinion piece on the wimp effect in men’s fashion. – Billy Reid needs a new pair of shoes.